In addition to comic books, I also purchased some trading cards and toys(surprise, surprise 😉 ), at the most recent Albany Comic Con. The best of the bunch is excluded, as they will be in a subsequent post. I’m always game for non-sprts trading cards, especially when they’re from the years when I was heavily collecting. 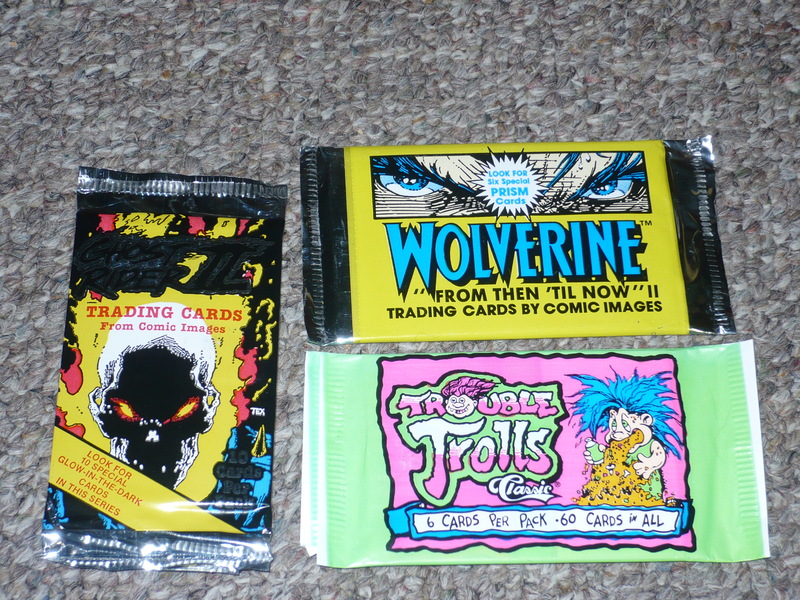 The Ghost Rider and Wolverine cards are ones that I clearly remember. The Trouble Trolls are a different story though. I remember Trash Can Trolls, and they were great. Rip-offs of Garbage Pail Kids, but great none the less. So these the Troll cards were purchased more out of curiosity. More than likely, you’ll see these packs opened over on my other blog. These came out of a 5 for $1.00 box. An here’s the rundown, clockwise. The Luigi toy is from the 1989 Super Mario Bros. 3 McDonald’s Happy Meal. I only have one other toy from this series, so there wasn’t a question at 20 cents. Then we have Petunia Pig as Wonder Woman from the 1991 Looney Tunes/DC Comics(? ), Happy Meal. The only one I’m missing is the Daffy Duck/Batman figure from this set. I had it at some point in the last few years(as well as when it was originally released), and I cannot seem to find it. Petunia here, is a double. So, it’s up for grabs, if anyone is interested. Megavolt looks like a cereal premium, but I can’t be sure. It’s stamped 1992, and it looks right for the time, but I just don’t know. You can’t go wrong with Darkwing Duck anyway. 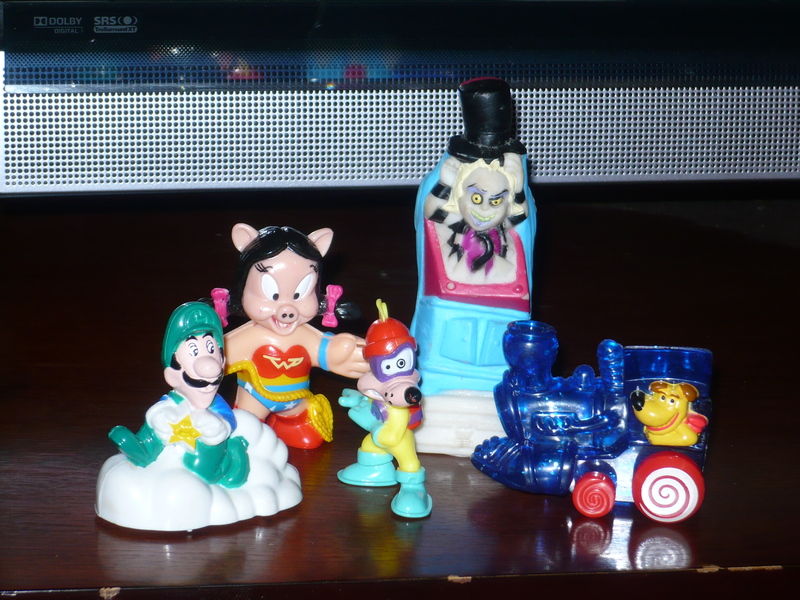 I’ve mentioned the animated 1989 Beetlejuice Burger Kings toys in the past. And it’s no secret that I’m a fan of the animated series(as well as the movie), but these just don’t turn up at all in my travels. So I will pick ’em up anytime I see them. 2 down, 4 to go! The last one seems like something insignificant, but it might be my favorite(and these are all great). It’s a 1991 Back to the Future animated series Happy Meal toy! I couldn’t tell you anything about the other toys in the series, but I sure as hell remember this one! It doesn’t do anything but roll on it’s wheels, but I love it! The next post is a sponsored post, but the one following will conclude(and include), the best of my purchases from the ACC. This entry was posted on November 18, 2012 at 22:55 and is filed under Comic Books, Toys, Trading cards, Video Games with tags Albany Comic-Con, Back to the Future Animated, Beetlejuice, Burger King, Classic Games, Comic Images, DC Comics, Ghost Rider II, Happy Meal, McDonald's, Megavolt, Petunia Pig, Super Mario Bros. 3, Trading cards, Trouble Trolls, Wolverine. You can follow any responses to this entry through the RSS 2.0 feed. You can leave a response, or trackback from your own site. HAHA…I miss those cards too. Those were the days. They sure were. Comic related cards were starting to take off at that time. I didn’t know you collected cards or had a trading card blog too. Same here. While I don’t do hockey cards, I do collect other sports as well as non-sports like comic cards and GPK. I only started that blog a few months back. I’ve check out Carboard Collections before, but I’m a hockey guy. You are linked on a few of the blogs that I’ve visited before though. But I wouldn’t mind trading links for our other blogs.